"Life is so delicious, with Brim's Snacks!" Ledbetter Foods-Memphis, Tennessee (901)-948-4788 "Made Better, Taste Better, LEDBETTER!" Ledbetter Foods is the sponsor of "The Ledbetter Better Players of the Game". 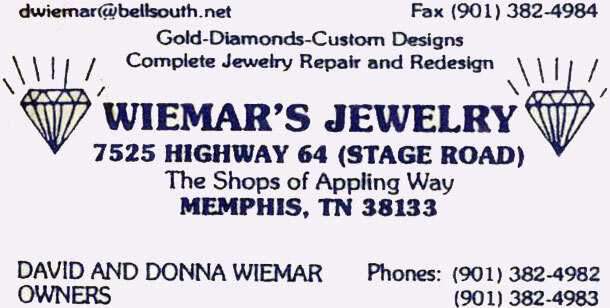 "Your COMPLETE Jewelry Repair and Redesign Center"
"The Home of Bartlett's BEST STEAKS!!!" "Serving the communities of Bartlett, Cordova, Lakeland, and Arlington"
"Helping your financial anchor hold"